Description: This is the best flying jet bike game ever made lol. 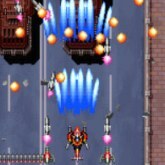 Armed Police batrider is an amazing Japanese arcade shoot Em up game that takes place in a world filled with robotic terrorism. The Zero-Corps have been drafted to take down GiganTech's robotics. There are 9 characters to choose from zero-corps, you choose from groups of three at a time, In addition to 9 unlockable characters. The full game mode offers 7 stages to play through in all.The text is in Japanese, so progressing through the games menu (Pressing the "X" Key) will get you to the game no matter what. Game Controls: Shift Key = Insert Coin. Enter Key = Start. Arrow Keys = Move. "Z, X, C" Keys = Action Buttons. See option icons at bottom of the game screen to edit controls, Play In Full Screen, Save/Load game progress, and change graphics settings.